First Nations Elder Raymond Robinson circled the room, shaking each member of the audience’s hand before taking his place in front of the microphone. “This is what life is about, taking the time to say hi,” he says to crowd. If Robinson’s lecture had happened only a few days prior, the handshakes would probably not have been punctuated with the sound of the press’s flashing cameras. The crowd on the seventh floor of Concordia’s Hall Building would have been scarcer; a TV cameraman wouldn’t have been there to look at the flickering florescent lights disapprovingly. Whether they had been following the Idle No More movement since its beginnings or just happened to catch Robinson’s interview on the CBC the night prior, journalists and attendees alike looked into his eyes with genuine appreciation as he made his way around the crowd. This may be the last opportunity they’ll get to shake his hand. 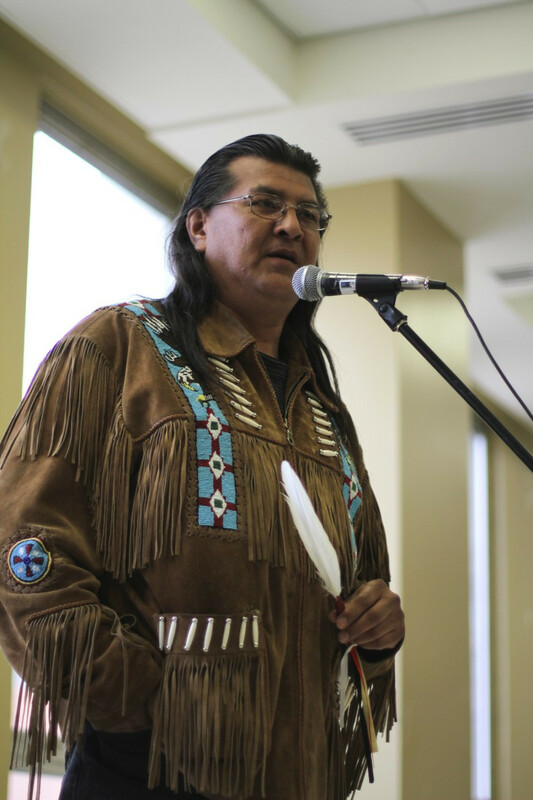 April 2, one day prior to his scheduled talk at Concordia, Grand Elder Raymond Robinson of Cross Lake, Manitoba announced that he would be going on a full hunger strike starting April 3. To protest Prime Minister Stephen Harper’s lack of consultation with Canadian First Nations, Robinson has vowed to not consume food or water until a “nation-to-nation” meeting is held between the two groups. “I’m not trying to commit suicide—I don’t condone to anybody what I’m doing,” he said. Robinson said that a hunger strike was a traditional way to seek higher intervention. “When we need something for the benefit of our nations, we go into fasting. We go into hunger strikes; we sacrifice ourselves hoping that a higher power—the creators—hears us though our sacrifice, putting our lives [at] risk,” he said. Robinson announced his plan to strike the previous morning on-air on CBC’s Power & Politics, a weeknight news show focusing on national politics. His talk at Concordia had been organized before his announcement, but he still upheld his commitment. Robinson was first in the national spotlight last December, when he and Attawapiskat First Nation Chief Theresa Spence both went on a hunger strike, consuming only tea, fish broth and water for six weeks to draw public attention to First Nations issues. “I’m going all-out this time,” he said during his talk at Concordia. “Harper has a ‘take it or leave it’ message for us First Nations. I’m giving my message to Harper, my take-it-or-leave-it message. Let’s play checkmate; let’s play chess. Two pieces of legislation mentioned recurrently throughout the two-hour talk were bills C-38 and C-45. Omnibus bill C-38, also known as the “Jobs, Growth and Long-Term Prosperity Act,” was subject to much debate when it was passed, with critics saying that because it introduces, repeals or amends 70 federal laws, it undermines democracy and does not give Members of Parliament enough opportunity for debate. Robinson referenced many parts of the bill that caused him concern, such as those parts that affected environmental protection. He also mentioned the bill’s violation of the federal government’s legal obligation to First Nations treaties and aboriginal rights. Better known as the “second omnibus bill,” C-45 raised concerns among many First Nation communities because of its changes to the Indian Act, the Navigation Protection Act and the Environmental Assessment Act. “With [these bills] C-38 and C-45, you don’t even own your own land. The government can come and do whatever they want with your land,” said Robinson. Robinson appeared once again on Power & Politics on the third day of his hunger strike, April 5. Earlier that day, he had met with Aboriginal Affairs and Northern Development Minister Bernard Valcourt. Although he was glad the meeting took place, Robinson said it was only a positive move because Valcourt is in a position to bring about change. However, he was not pleased with the outcome of the meeting. And for Robinson, that wasn’t a surprise. If the meeting had one purpose, it was to back up his concerns regarding the dire needs of Canadian aboriginal reservations. Robinson referenced his experience on his own Cross Lake reservation, speaking of its lack of development and its history of high suicide rates. Raymond Robinson during his speech at Concordia. 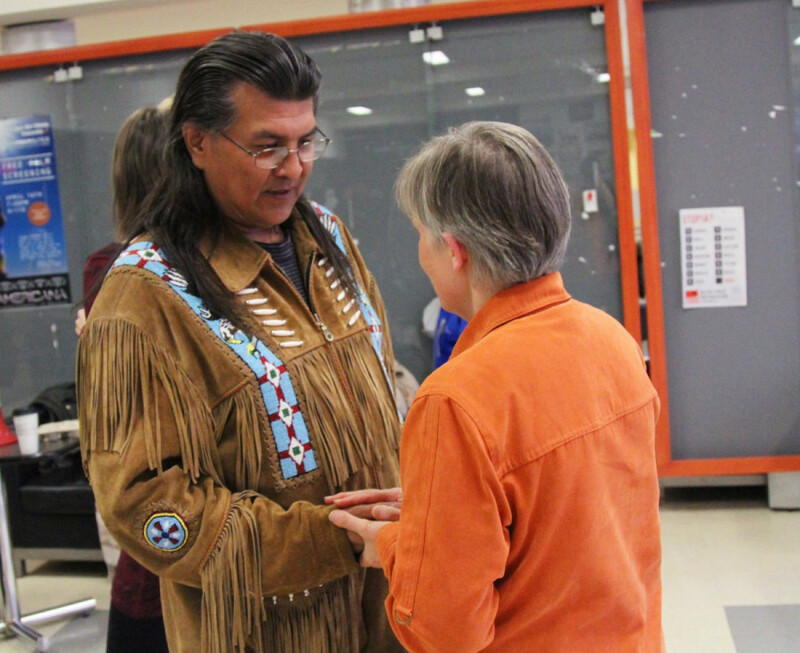 Robinson asked Valcourt to relay a message to Harper, asking him to urge the prime minister to start meeting with First Nation leaders to create a dialogue on aboriginal issues. Robinson said that in response, Valcourt laughed. “That is never going to happen,” Robinson quoted the minister as saying. As of April 9, Robinson will have been on a full hunger strike for seven days. At Concordia, he said that he was told he would only last three or four days before dying of dehydration. So far, he has lost 12 pounds. Dr. Blake Woodside, medical director of the program for eating disorders at Toronto General Hospital told Canada.com that his weight loss is consistent with that of someone who has not consumed food or water for as long as Robinson has. Robinson’s speech at Concordia ended with a question-and-answer period. Instead of talking politics, most of the crowd expresses their gratitude toward his selflessness. John Symon, a member of the audience, mentioned social media’s response to Robinson’s fast, saying that many were concerned that his potential as a martyr for the cause would not be as useful as his continued fight for justice if Robinson were to end his hunger strike. “You mentioned a few minutes ago that each one of us has the power of life in our hands,” said Symon. “I’m conveying this message to you, because I’m afraid that the Harper government is not going to listen to too many people very quickly. “Please, in the very least—take water,” Symon urged. Robinson finished his talk on that note and responded by saying he would consider the option. On Monday evening, over 20 cities around the world held nighttime vigils in support of Robinson’s plight. In a video released Sunday, he stated that he will continue his strike until he hears from the prime minister regarding his requests. Update: Elder Raymond Robinson has recently announced that he ended his hunger strike at 12:00 p.m. Monday night, after five days and 15 hours without food or water. More updates to come.